Vampire The Masquerade is a popular pen and paper roleplaying system first published in the early 1990’s. Its compelling, dark fantasy world offers players and game designers alike plenty to sink their teeth into. At the turn of the millennium, Activision released the first of two PC games based in the Vampire The Masquerade universe. For fans of Masquerade or vampire fiction in general, Redemption is an entertaining though often frustrating roleplaying game that will reward more patient players with its compelling story. To install Redemption, place the first CD-ROM in your computers optical drive. Now use Computer/This PC to browse to the disc and open it. There is a folder named “Setup” on the CD, open this folder and run the “Setup.exe” file inside. The game should now install automatically. If you install the game to the default folder (which will be “Program Files” or “program files (x86)” ) you may encounter difficulties when trying to save your game. See the troubleshooting section at the end of the article for more information. Before playing the game, you should download and install the V1.1 patch. You can download the patch here. Use the “Softpedia Secure Download” link to download and avoid the green download buttons as these are misleading advertisements. The patch is downloaded in a zip folder. To install the patch, simply extract it from the zip folder and then double click on the downloaded VampirePatch_1_1.exe file and follow all on-screen prompts. Resolution and visual quality settings can be configured by starting the game and going to the Options menu. Once in the options menu, click on “Display Options” to access the games visual settings. The picture below shows these settings. At the top of the window, you can choose which graphics device to use. Usually there is only one choice here. Choose your video mode (or screen resolution) using the list in the middle of the window. You can play the game in any resolution but make sure it is a mode with 32 BPP (bits per pixel). You should note that if you choose a widescreen resolution (such as 1080p, 1920×1080), certain elements (typically the menus and HUD) may appear stretched. The brightness option at the bottom of the window should be adjusted to taste. The game has some very dark sections so temporarily increasing it to maximum may occasionally be necessary. 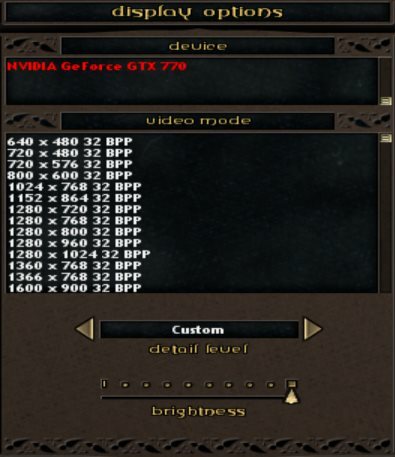 If you’re running the game on a modern PC, you may wish to turn all the quality settings up to high. To do this, first select “Custom” in the detail level box. There should be an “Advanced Options” link just below the display options box. Click this and a huge range of advanced options will appear. Generally, on a modern PC, all of the options can be set to their maximum. Move all of the slider controls to the right and ensure that all the options are enabled. Texture filtering should be set to “Trilinear” and static lighting to “Lightmap”. Click on “OK” when you are done setting these options. Sound settings can be configured by starting the game and then choosing Options and then Sound. The picture below shows the options you will then see. The first thing you will need to do is choose which sound processing technology to use. 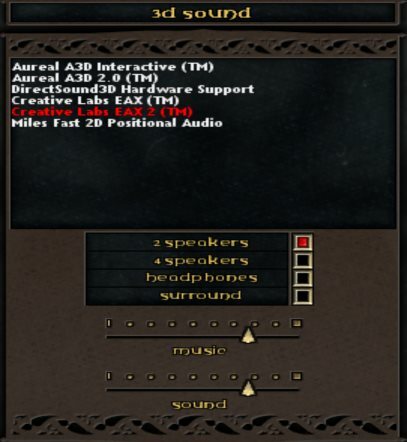 Like most games from this era, Masquerade supports enhanced sound effects for PCs equipped with specialised sound cards. For the best sound quality, the game can use EAX2, which relies on OS components no longer present in Windows Vista, 7 or 8. If you have an EAX capable sound card however, you can use the Creative ALchemy software to restore EAX functionality. To do this, first quit the game and then start the ALchemy tool. On the main ALchemy window, click on the “Add” button. Now, browse to your Vampire The Masquerade – Redemption game folder and click “OK”. Leave all the other settings as the defaults and click “OK”. The next time you start the game, you will be able to enable EAX sound from the Sound menu. If you don’t have an EAX sound card, you will be limited to the Miles Fast 2D Positional Audio option. The Aureal A3D and DirectSound3D options only work under Windows XP with specific sound cards. In the box in the middle of the window, choose a speaker setup that matches the one connected to your PC. The two sliding controls at the bottom of the window will adjust the volume of the music and sound effects respectively. Click on “Exit” when you are done reconfiguring these options. You’re now all set to start your adventure in the dark world of Vampire The Masquerade – Redemption. By the way, don’t forget to pick up your torch before you enter the mines! The popular PC gaming utility Xfire supports Vampire The Masquerade – Redemption, allowing you to take screenshots and videos and chat to your friends while playing. There is an incomplete but still under development texture upgrade pack available here. Introduction videos do not play correctly:- On our Windows 8 machine, the two introduction videos did not play correctly. Playback was extremely stuttery. However, the opening video that plays when a new game is started worked absolutely fine. Since we haven’t completed the game we can’t say for certain that other videos won’t suffer from playback problems. The videos themselves are in your Vampire The Masquerade – Redemption program folder in the sub folder “Video”. You can watch them with Windows Media Player or similar playback software if you have a suitable codec pack installed. Problems saving games:- Like many old titles, Vampire The Masquerade – Redemption saves its game data into the same folder as the game itself. In some instances on more modern versions of Windows, this will mean that save games cannot be written. To solve this problem you can either run the game as administrator (right click on the games icon and choose “Run as administrator”) or, better still, set the permissions on the game folder so that your user account has full control. You can find a tutorial on how to configure folder permissions here. It was really useful, thanks a lot. this was useless… there are no videos that will play on any player… and i dont wish to install some crap i no nothing about… how about GETTING IT RIGHT IN THE FIRST PLACE!!!!! Whoa there, what exactly do you mean “there are no videos that will play on any player”, can you actually explain what issue you are having, rather than just having a random rant? Clicking the setup.exe never worked, tried it several times. Nothing happened. Worked for us just fine, hmm, did you try compatibility mode? I’m playing on a laptop and my keyboard will not work at all in game! Any help wood be appreciated! Really helpful article, but that ‘slightly outdated goldie’ still has the area transition to Vienna crashing with any patch and any mod. Can you explain a bit more about this fault? i try’d installing it on windows 10 but for some reason after setup it goes to the background procceses and i can not see it or do anything with it. Possible copy protection issue, not sure, sorry.